I was initially drawn to comic books simply because I loved superheroes, and wanted to find more stories about them. Story is still probably my favorite part of comics (or anything, really), but over the years I’ve learned to appreciate the specific strengths of comic books as an art-form, the things they can do that no other medium can. 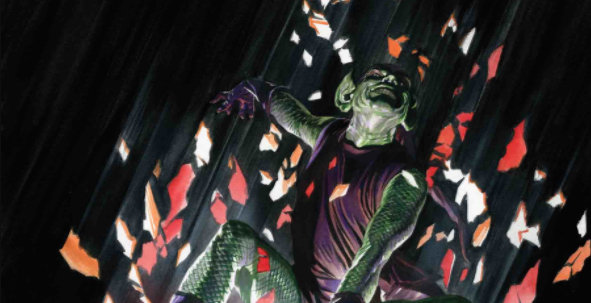 Dan Slott and Stuart Immonen certainly understand those strengths, as their Amazing Spider-Man 797 revolves around a sequence that just wouldn’t work on TV or in the movie theater. 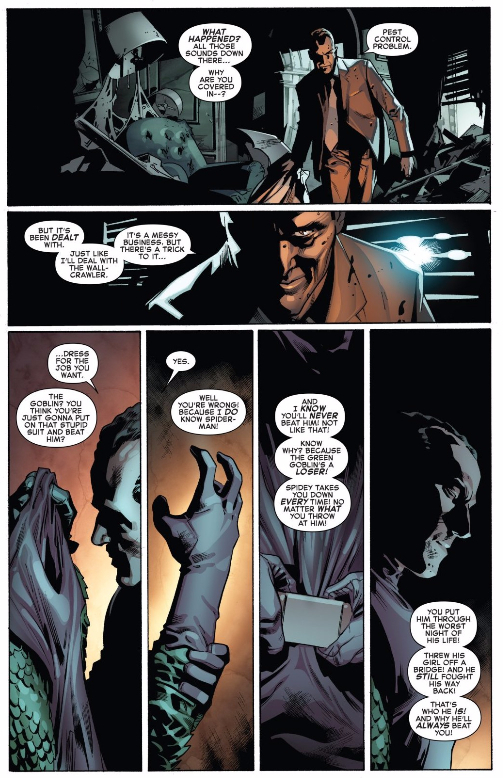 That sequence, which runs throughout the issue as a bit of a framing device, finds Norman Osborn monologuing to a figure he has tied to a chair, a figure he kidnapped in an attempt to find Spider-Man, a figure who remains off-camera and unidentified until the very last page of the issue. That, in and of itself, is not unusual. I’ve seen similar scenes in movies; Immonen even uses similar tricks here to obscure the figure, such as presenting many panels through the figure’s own eyes or point of view. The difference here, though, is that Osborn’s captive gets to talk. That would be a no-no in any medium with sound; the figure’s identity would immediately be given away. But in a comic book, they can just gab away without ever risking prematurely revealing their identity, allowing Slott to milk the suspense and hold the twist for as long as possible. See? These two characters have an entire conversation without us knowing who one of them is, despite the fact that any Spider-Man reader would know who the figure is if given even just one more identifying feature. Another impressive fact about this is that, while comic books don’t have sound, they do have “voice.” The best writers can differentiate their cast by the way each character speaks alone, and Slott certainly knows how to do this. Take J. Jonah Jameson, for example. There’s no mistaking this dialogue for any other character’s! 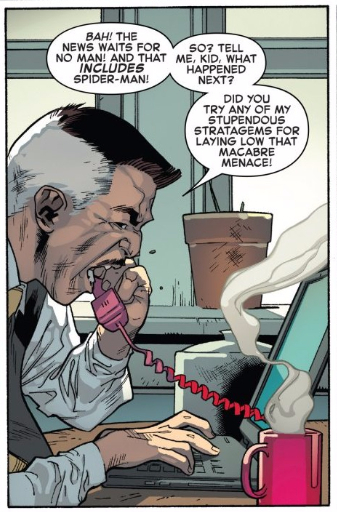 That’s what makes it so impressive when Osborn’s mysterious hostage ends up being JJJ — Slott managed to create dialogue for JJJ in the Osborn sequences that still sounds convincing coming from him, without delving into the kind of bombastic dialogue that would have immediately given his twist away. It’s a sign of a writer who understands how his medium works, and isn’t afraid to take advantage of it. Actually, the fact that Jameson knows Spider-Man’s identity at all speaks to another concept mostly unique to comic books: shared continuity. Jameson discovered Peter’s identity fairly recently in the pages of Chip Zdarsky’s Peter Parker: The Spectacular Spider-Man, but Slott is able to fold the development into his Amazing Spider-Man with no hassle or fanfare. Again — this creative team sure understands their medium of choice. And yeah, I know neither technique I mention here is 100% unique to comic books. Shared continuity exists in other mediums, but in most cases they’ve clearly been inspired by comic books, especially in situations like the Marvel movies or even the Arrowverse of CW superhero shows. It’s a comic book trick, first and foremost. And while tv and film couldn’t recreate the JJJ/Osborn surprise here, prose could, but not nearly as effectively. Prose would have to draw an awkward amount of attention to the fact that we don’t know who Osborn’s hostage is, especially when it comes to naming the character or finding ways to refer to him (notice how many times I say “the figure” in this piece). In a comic things feel much more subtle — our attention is drawn to what we DON’T see (the figure’s identity), allowing Immonen and Slott to obscure JJJ’s identity elegantly and naturally. It’s a sequence perfectly suited to the strength of sequential, visual storytelling. I liked a lot about this comic as well. I also liked that JJJ ends up being the bad guy here again – after all these years he finally learns Spidey’s identity, he even wants Spider-Man’s approval, and he blows it. THIS is what finally to me made Jameson a sympathetic character. None of the stuff Zdarsky did, but here. That doesn’t surprise me, really. I like Zdarsky as a writer and artist (and as a person the couple times I’ve met him), but I do think Slott has a sense of story that few modern writers do. I know he’s not everyone’s favorite, but he’s going to go down in history as one of the three most influential Spider-Man creators ever in Spider-Man’s first 60 years. This portrayal of Osborne is pretty darned effective, too. This is Osborne finally unhinged. He’s obviously always been crazy, but now this is a new level. He’s just oozing menace. I can’t wait for more out of this story.